Marines who label themselves modern-day heathens and wish to mark their grave with Thor’s hammer — their religion’s version of a cross or Star of David — now have Veterans Affairs approval to do so. While some only know of Thor as a comic book hero, he actually dates back to Norse mythology. Thor used his magical hammer to protect humans and other gods from giants. 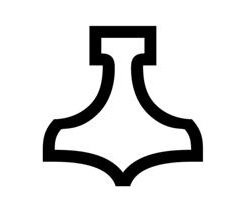 But today, that hammer means something special to those who practice Ásatrú and worship the Norse Gods. And as NPR’s “The World” reported last week, those who identify as such and served in the military now have the option of marking their gravestone with Thor’s hammer. NPR interviewed John Browlee, a Boston-based writer who reports on technology, about the tie between those who practice the religion and Thor’s hammer. He estimates there are between 10,000 and 20,000 self-labeled modern-day heathens in the U.S.
To them, Browlee said, Thor’s hammer is their sort of crucifix — the symbol of their religion. It symbolizes what Thor stands for: honor, bravery, loyalty and virtue. Many of the same traits respected in the military, he added. But getting Thor’s hammer recognized as a legitimate religious emblem by the VA wasn’t easy, he said. Reason being that the VA had a problem with pagan symbols, and Thor’s hammer got lumped into that debate. Now Thor’s hammer is one of 56 symbols approved by the VA that those who served in the military can request to have added to their headstones. What I want to know is if there is a symbol for Iron Man, too? God said, thou shalt have no other god before me! The Constitution says that we shall have religious freedoms, including those that some might not agree with. This story…I like it. Another! What about those of us who worship the ‘Jack Lord’ ?? PRI did a follow up story with folks that actually follow the religion in question, Brownlee’s article failed to reference or speak to any heathens. Josh Heath just posted above with the corrected link. What he didnt post is that he and his wife along with some others where instrumental in getting the article corrected, Also Josh was one the folks that has fought the VA in getting OUR symbol on OUR headstones. Thank you Josh! HOOAH! Typical Grunt cant even spell his own name! The number of Heathens (those who follow the gods of our Northern European Ancestors) are far higher proportionally in the military than in civilian life. The virtues that are the core of our beliefs are indeed the ones that call upon our men and women to set aside their safety and freedom to risk their lives to defend their lands. I served in the Canadian Armed Forces, as my understanding of my duty to my gods, and to my nation, compelled me. I am pleased to see my American brethren who served their gods, and their nation even unto death, will have the same right to be buried under the sign they lived. Any that have a deeply rooted belief should have the FREEDOM to choose which ever symbol represents that belief. If your religious doctrine does not encompass the ability to let others alone to have what ever eternal peace between them and their god (or gods), bugger off. Your opinion is neither necessary nor wanted. In the city cemetery of Turlock, CA is a grave with a symbol of the IWW (International Workers of the World). The man buried there was very proud of belonging to that organization. Few now know it barely exists anymore or what it did when it was vital. Read “Ozymandias” by Percy Bysshe Shelley and reflect. Still have a great many symbols to go. If Christians have so many than we all deserve our own variety symbols. Waiting the hear when the Awen is recognized for the Druids. Personally, I feel that anyone who has volunteered for service, and, in that service, given their lives, has earned the right to have whatever they damn well please marking their final resting place. You want a pentacle? Cool. You want a Thor’s hammer, you got it. You want a cross? Fine. You want a statue of Cindy-Lou Who? Let’s find a sculptor who’s good with ponytails. As an Asatru adherent of over 25 years and a vetran, I am glad to see the ruling. As a man and a veteran, I am saddened that it took someone’s death to make this happen. The big salute goes to a son and his father whose wishes were met and their mom/wife who accomplished the deed. Thor dates back to well before Norse mythology. He was a king of ancient Germany. @Roger Wilson, yep it does. But it doesn’t say you can’t have any other Gods. In fact in Genesis it says let US create mankind in OUR image now doesn’t it? @Roger Wilson, but just as important is that oath that says. You know, the one that says we ALL have the freedom to practice what ever religion we wish….